Well, it was getting quite late last night and I was finishing up my last batch of soap. I got my water "mixture" out of the fridge and whisked it into my oils with my fragrance. Soap whipped up like frosting, which I thought was weird but I've never soaped with cold water/lye. 1. 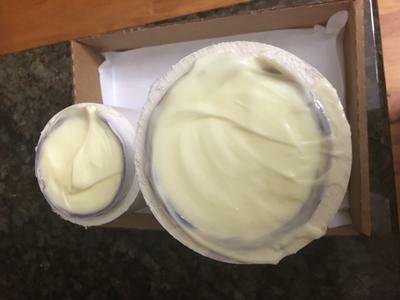 Can I scoop the oil/water mixture out of the mold, and then add some additional water so that I can dissolve my lye and then whisk it all in? I know this will require a much longer cure time due to additional water. 2. Should I make another batch (it's not a big batch) - mix all of the oils all together, put the 'missing' lye into the new batch's water solution and then whisk all together and re-pour? Any help is appreciated - I can fix this when I get home from work tonight... thanks! Oh goodness Shannon...I'm so sorry but you made me giggle! I could just picture you when you realised what had happened...one of those face palm moments! The 'soap' does look lovely and creamy though! I would go with option number 2. Melt your first 'oil & water mixture' along with the new oils for the second batch. Use the full water amount for the second batch and add both batches of lye to it. Then proceed as normal. At least with this mistake you know exactly what happened...that's a rare occurrence! Comments for Forgot to add the lye!